Check out the left side of the chain! Skip Kohler, Jeff Beard and Bob Leib were proud to represent our Class at last evenings 20th Company Dining Out. 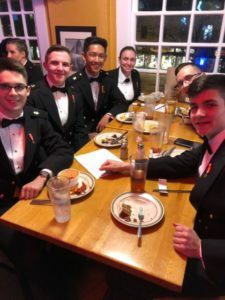 It was held at “Buddy’s Crabs and Ribs” and a super evening was had by all! 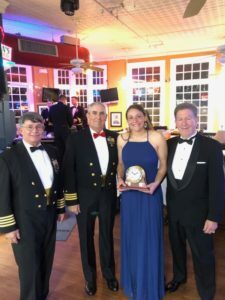 The Class of 1972 Leadership Award was presented to Midshipman First Class Marie Valenti who hails from Pennsylvania and is the Captain of the record setting women’s lacrosse team. 20th Company did themselves proud, putting on a really first class “Dining Out!! 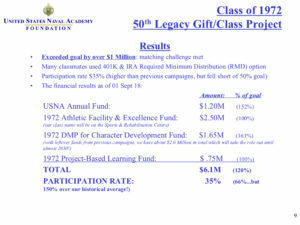 Attention World, Attention World…Class of ’72 50th Reunion Legacy Gift Campaign Sets New Record For USNA Foundation! We’ve been working on this for well over a year, and I wanted to share our results with you, now that we’ve wrapped up the solicitation phase of the campaign. In a nutshell…we nailed it! I’m including our results to-date. As you recall, we set what many thought was an unrealistic goal of $5 Million…more than any other class has raised…but based on a $2.5 Million “match” by our anonymous classmate. In other words, if all of the rest of us raised $2.5 Million, he would agree to match that amount. We also set goals for a record four different projects: (1) Naval Academy Annual Fund (2) The 1972 Sports & Rehabilitation Centre (w/our name on it) (3) The Distinguished Military Professor (DMP) for Character Development and (4) Project-Based Learning. Well, we ended up blowing through our $5 Million goal and, as of this month, we have raised a bit over $6 Million! In addition, we’ve met all the individual project financial goals as well! What I’m most proud of though is the participation rate, which is right around 35% …a bit over a third of the class….and our highestparticipation rate compared to all of our previous campaigns. The reason we did so well was because of you….you all bought into the campaign, the goals, and a record number of you ended up participating. 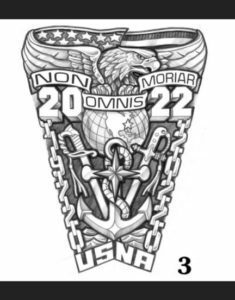 We should all be proud of an achievement that has never, ever been reached in USNA history, according to the Foundation. It’s a record that the Foundation feels will last for a long time. So, here are the summary results. These numbers will continue to trickle higher as there’s still a few classmates that we’re still chasing down. 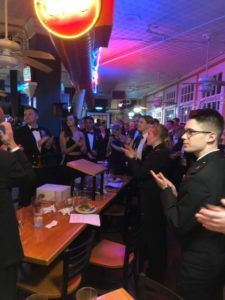 Also, for the next five years, any of you that participate in the annual Naval Academy fund drive….or the all academy challenge…all of those additional funds will get added to our campaign totals! Tried & true with ’72! My “last call” of two weeks ago needs a follow-up “final call”, thus I turned to a “chow call” as a way of alerting those still on the fence to come on over. If you haven’t been contacted, or somehow have fallen through the cracks, please print off a pledge sheet, fill it out, and send it into Melissa Nelson. If you’ve already sent in your pledge, but think you’d like to alter it to help us reach our goal, please call Melissa Nelson. Finally, since we’re also below target on our participation goal, here’s the number of participants, by company and their totals. Congratulations to 11thCompany with 13 participants and $149,000 in pledges. 23rdCompany is at the bottom with zero participants and zero pledges. In all, we only have 187 classmates participating. Can we ask those companies at the bottom of the list to try and get your numbers up to at least five people? This would put us over 200 participants and probably be enough push us over the top. We’ve asked the company reps to urge their company mates to improve your company’s relative standing. I really feel confident that we’re going to blow through our $5 Million goal. I’ll tally everything up in late August and provide a final report back to you in early September. The active/solicitation phase of Legacy Campaign nearing end! Last summer (2017) we raised awareness and ran a survey monkey to get your input on projects to include in the campaign. Then we showcased each component before our October reunion, and reviewed the goals at the class business meeting. Our campaign committee called the (historical) top 50 donors during the pre-campaign in late 2017, got us off to a good start, and we launched the formal campaign in March 2018 with the rest of the class. Since then, Catapult (our vendor) has been writing letters and making calls. They’ve processed 242 prospects resulting in 68 pledges totaling $358,654. They are working on the last 368 classmates now, and intend to complete the entire class by the end of this month. By the week of July 13th, they will have chased as many rabbits as much as they can and will turn in their final report to us. The good news – we’ve now raised just over $4 Million (with matching) and seem to have a good chance to hit our goal within the next couple of months. The bad news – we only have a few over 200 classmates contributing to the campaign, way below our goal of 50% (plus we still have to hit our financial goal). So, this is our last call. If you haven’t been contacted….or you have been contacted but not followed up with….or you told Catapult “no” but have now changed your mind, please click on this link to our pledge form, print it off, fill it out, and send it in to Melissa Nelson at the Foundation Office at the address on the form: http://1972.usnaclasses.net/wp-content/uploads/sites/17/2018/03/Class-of-1972-Pledge-Form.pdf. Regarding which areas to support? 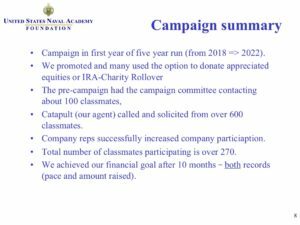 We’re doing well on the Naval Academy Fund and the DMP. We still need help on both Project-Based Learning AND the Sports & Rehabilitation Centre (which will bear our name if we can raise $2.5 Million). For those of you that have already pledged – thank you! 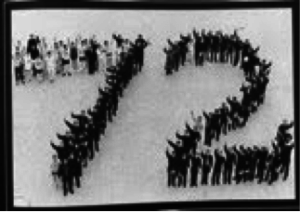 For those of you that have not yet pledged – please consider participating in this historic (and last) campaign for the Class of 1972. We’ve raised $3.6 Million (w/matching) of $5 million – Largest USNA Class Gift goal ever! Our very generous classmate (who is challenging the rest of us to raise $2.5 million for our 50th Reunion Gift Campaign) is matching our donations dollar-for-dollar up to $2.5 million. $2.5 + $2.5 = $5 million! Remember, he will only match what we give! Over 300 classmates (out of 810 on the list to call) have participated so far, and Catapult (the group we’ve hired to contact all of you) will have the remainder of you contacted by the end of this month. If we keep up this rate and level of participation, we should hit our goal by September! $2.5 Million raised will support the 1972 Athletic Facility and Excellence Fund. Do you remember “Misery Hall?” The place we used to go to get taped up, rubbed down, and otherwise repaired so we could continue to compete in our chosen sports. Our gift will support construction of the Terwilliger Physical Mission Center which, if we meet our $2.5 million goal, will house the 1972 Sports Performance and Rehabilitation Center (with our name on the door!) – the new ’72 Misery Hall that will serve all mids, not just varsity athletes. $750,000 raised will support the 1972 Project Based Learning Fund. Our gift will support hardware and logistic costs for capstone projects required of all engineering majors. Interdisciplinary teams of mids conceive, design, build, test, and sometimes redesign, rebuild and retest autonomous land, air and sea vehicles, low-earth-orbit satellites, cockpits of the future, remote sensing systems, and other things we never dreamed possible as mids! If you’ve already been contacted but haven’t yet received your packet with the Pledge Form…or don’t want to wait for your call from Catapult, here’s a web-link where you can print off our Pledge Form and mail it in: http://1972.usnaclasses.net/wp-content/uploads/sites/17/2018/03/Class-of-1972-Pledge-Form.pdf. Keep up the great work guys…and thanks! We’re about halfway through the campaign. Calls have been in progress, in tranches, to the class since April, and this will continue until the end of June and we reach everybody. Each of you get a letter, an information sheet, then a call. We have well over 100 donors thus far, and we’re making good progress on getting the participation rate to 50%. All four project areas are being supported, with strong support to the DMP project, and the Naval Academy Fund. After that, the 1972 Athletic Facility & Excellence Project and Project-Based Learning are starting to pick up momentum. Counting the matching from our Anonymous Classmate, we stand today at a little over $3.2 Million out of the $5 Million goal…which is outstanding since we’re only now going out to the bulk of the class. Our stretch goals of raising $5 million with 50% participation will set a record for a class fundraising campaign at the Academy. What an honor it will be for our class to lead the way, helping educate and train the leaders of tomorrow at our beloved Alma Mater! The naming opportunity for the Sports Performance and Rehabilitation Center allows our class to leave a visible legacy on the Academy grounds. As Alexander Hamilton raps in the musical Hamilton, “I wanna build something that’s gonna outlive me!” This our chance to create something that will outlive us. Most importantly, our campaign includes four diverse components: the Distinguished Military Professor in Character Development, Project Based Learning, the Sports Performance and Rehabilitation Center, and the Naval Academy Fund. One of these likely speaks to your heart. Be sure to support that component! Our participation goal is as important as our financial goal, so please participate at whatever level fits your current situation. Remember that I will double your impact by matching all contributions dollar for dollar up to $2.5 million! For those who are wondering, this is a true match program. I am matching other contributions dollar for dollar and I am hopeful that match will reach the maximum amount of $2.5 million. Thanks A.C…..for those of you that haven’t yet been called that want to go ahead and pledge now, just send me an e-mail and I’ll send you the pledge form with instructions. We’re now into May, and my hope is that a majority of the class has been contacted and asked for your pledge to our class campaign. I’ve featured one of the four projects within our campaign every couple of weeks. This is the last component, the Naval Academy Annual Fund, which is the lifeblood of private gift support to USNA. Finally, the Annual Fund supports the mission of the Naval Academy Alumni Association, providing important member services and benefits such as Shipmatemagazine; alumni chapter, parent club and class reunion support. It also provides resources for the First Gift program, First Class Battalion Receptions at Alumni House/Ogle Hall and I-Day support—all functions that foster early development of a culture of philanthropy and engagement among our newest alumni. That’s it…. and thanks again for your support of our class campaign! Project-based learning and practical design experiences are an essential part of midshipmen education. 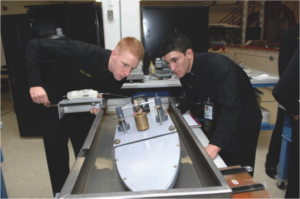 First, the sheer complexity of today’s naval weapon and engineering systems mandates a multidisciplinary, practical approach to bringing advancements in applied engineering and technology into Naval Academy classrooms. Second, the Navy requires 65% of each Academy graduating class to major in a Science, Technology, Engineering or Mathematics (STEM) discipline, and an emphasis on project-based learning is a critical aspect of attracting these students. Finally, engineering accreditation bodies are increasingly requiring outcomes-based engineering programs that culminate in a final Capstone design experience. The Academy’s annual federal appropriation does not fund the entire range of Project-Based Learning activities. Gift funds are essential to fund the “margin of excellence” between what the federal appropriation supports and what the Naval Academy requires. Expanding the emphasis on Project-Based Learning among all STEM major programs and at all levels of the undergraduate education (from plebe to first-class year) will promote a deeper understanding and retention of coursework, enhance critical thinking skills and excite, attract and ultimately retain midshipmen in STEM majors. Sailbot – An autonomous small-scale sailboat capable of self-navigating and self-sailing from the US to the UK. Several satellites that were launched during Space Shuttle missions. LIDAR based autonomous vehicle (golf cart) braking system. Concrete canoe for American Society of Civil Engineers competition. As I indicated a couple of weeks ago, I’m highlighting one of the four projects that make up our class legacy campaign. More of you should have received your letters asking for your support for our campaign, and one of our campaign reps will be trying to reach you over the coming days & weeks. To provide you with more background on each of the projects, here is the second component of our campaign, the Distinguished Military Professor for Character, a role we’ve supported for 15 years! 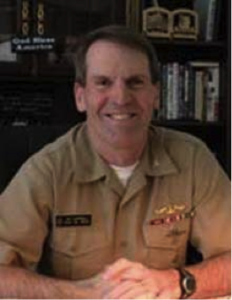 Moral: Distinguished Military Professor for Character– Recently retired senior military officers are uniquely suited to educating midshipmen in the critical areas of leadership, character development, and ethics. These Distinguished Military Professors (DMPs) manage a significant portion of the Academy’s Leadership, Education, and Development (LEAD) core program, providing valuable continuity as a complement to rotating active duty military faculty, and delivering tremendous dividends in the development, execution, and assessment of LEAD courses. There are currently three DMPs, and classmate Rick Rubel continues to fill the role of the DMP for Ethics. The Class of ’72 has funded the DMP for Character (Jim Campbell) for over ten years, and we are proposing to continue to support this role (fyi…Jim is in the final year of his contract and finishes next month). Class feedback is supportive of the principle for rotating the position periodically with an emphasis in attracting candidates with recent fleet experience. We’d like to aim for a level of funding of around $1 Million, which would extend the role for 6-7 more years, after which it will be supported by another (younger) class.